The woman’s mother was furious and soon a 5-gallon oil can appeared in the Stewart’s yard saying “C.E.D. has been” with the implication that Donnatin had been “canned” from his job. Denials and increasingly angry words were exchanged between the Stewarts and the Donnatins, and more items appeared in the Stewarts’ yard. An awning across the porch was painted with an attack on Donnatin and pieces of old billboards were set up on the lawn. Two tall poles were planted in the yard and on the line strung between them the Stewarts hung a series of 5-gallon oil cans painted with slogans about Donnatin. The cans became an irresistible target for neighborhood boys armed with rocks and the entire yard was eventually filled with trash, The Times says. And then, everything was gone. 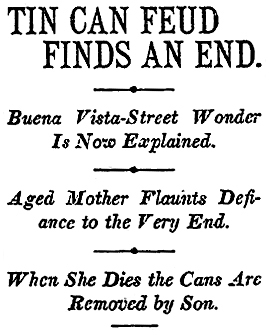 “As day dawned yesterday on a little cottage over on Buena Vista Street, life flickered from the body of aged Mrs. James Stewart and with the going out of her breath evidences of a neighborhood feud as suddenly disappeared,” The Times says.